Happy Thursday everyone! My goal is to not let a Thursday pass without sharing my favorite thing of the week, so better late than not at all this week! 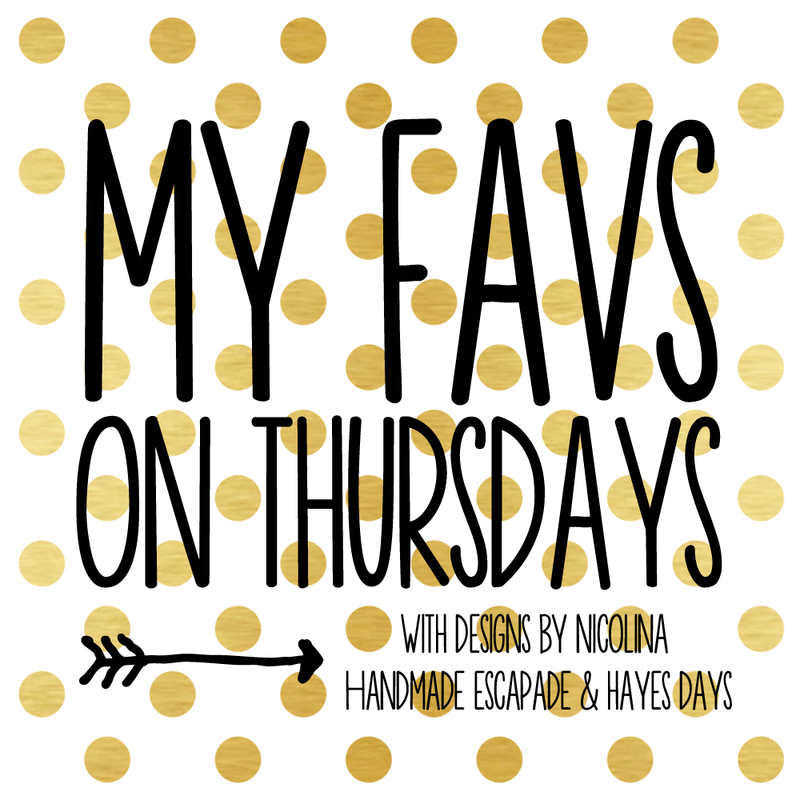 Make sure you check out Katy and Nicole to see what their fav on Thursday is, and if you want to share yours with us, make sure to link to the three of us and comment your blog post in the comments section. It’s going to be short and sweet this week because my favorite is just so simple. It’s the Repost App for Instagram. This app is everything I didn’t know I needed. Instead of having to take a screenshot of a photo to share it and then trying to make sure you crop it, credit it, and get all your hashtags right– you no longer have to worry about at least two of those with this app. So many small businesses are running giveaways via IG now. Repost app makes it easy to enter those. The steps are simple too. 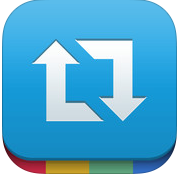 Open Repost, select the photo you want to post, then it opens in Instagram where you can still add a caption or a filter and share it via other social networks. It’s great! Also did I mention, it’s FREE?! You have to deal with an ad or two, but the ease of use is worth it. Have you been using Repost? Any other apps I need to check out that make Instagram easier? 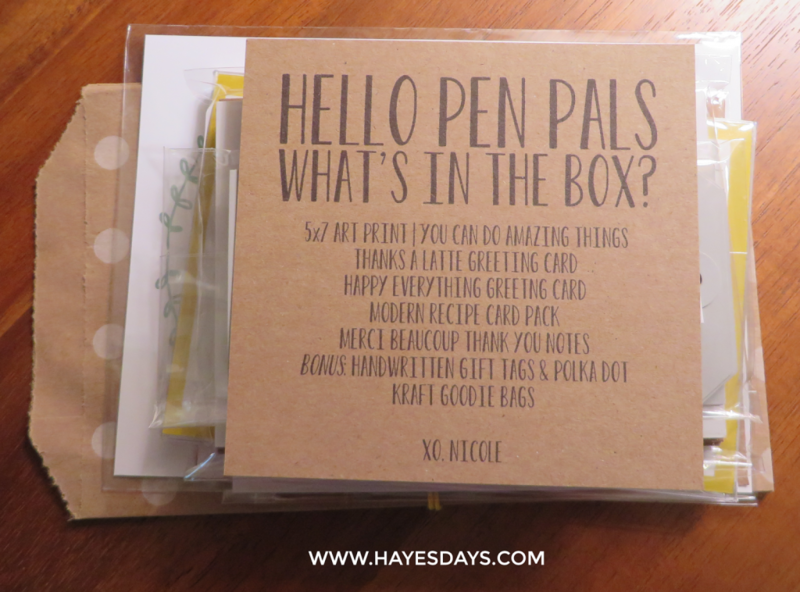 Get excited for two awesome things today: the giveaway winner and all of the pretties in my DBN Pen Pals box! The now husband and wife duo, Nicole and Cameron, of Designs by Nicolina always produce top notch paper pretties. If you’re looking for anything from invitations to art for your home, they have something to fit the bill. If they don’t, you can always request it to be made custom with confidence. 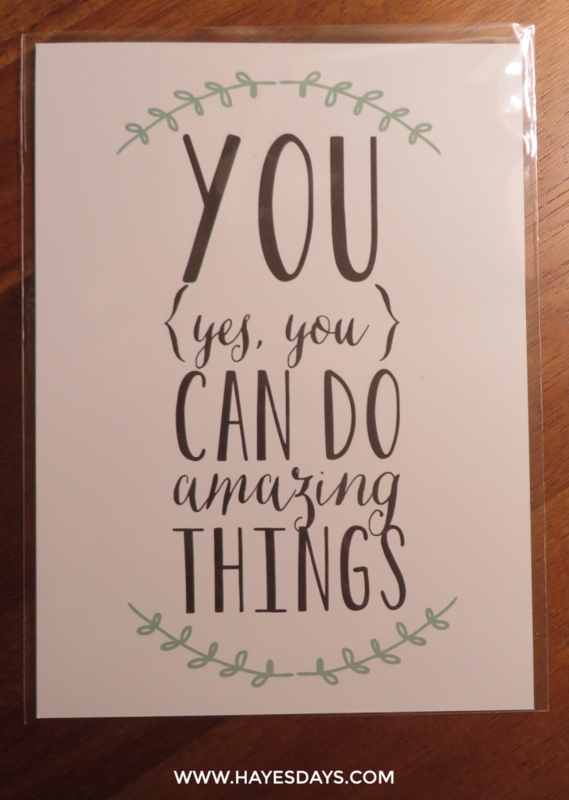 First, the “You Can Do Amazing Things” 5×7 art print. These smaller prints are great. I have a frame on my desk that I like to swap prints out of all the time. This one will be getting some playing time soon. They are also the perfect spot of color for a collage wall. Why not be inspired when you walk by your collage wall in your living room each day? These modern recipe cards are great. The paper is heavy duty, perfect for passing down those valuable recipes some day. They’re also great housewarming and wedding shower gifts. You get 16 in a set. 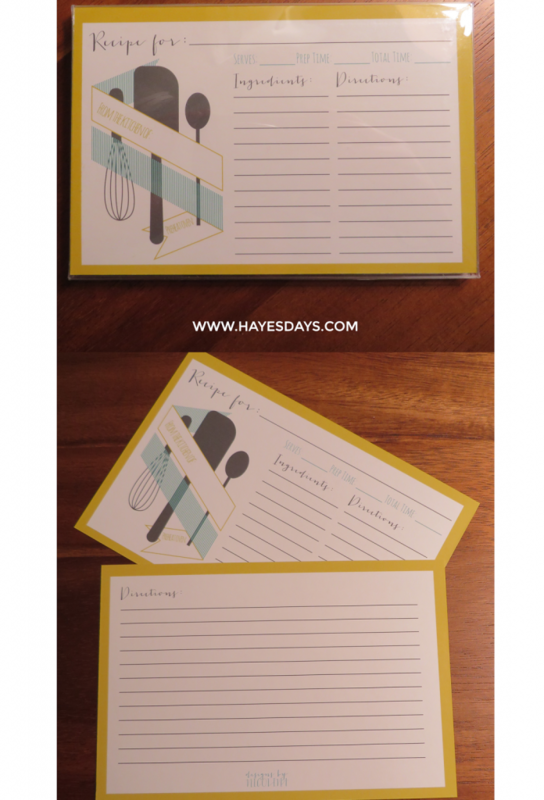 There is ample space for writing notes, ingredients, and directions. I was so excited to see these in there! No excuses now for not saying thank you! 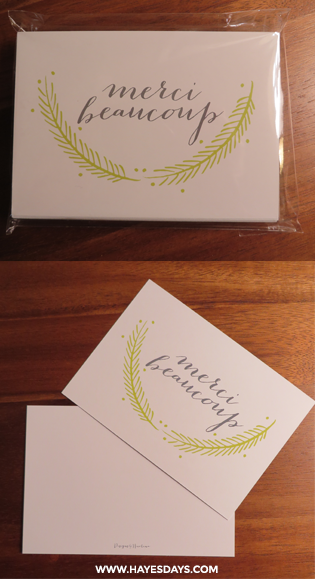 The merci beaucoup thank you cards are some of my personal favorites. I already own them in blue. I was thrilled to receive the vibrant green color. 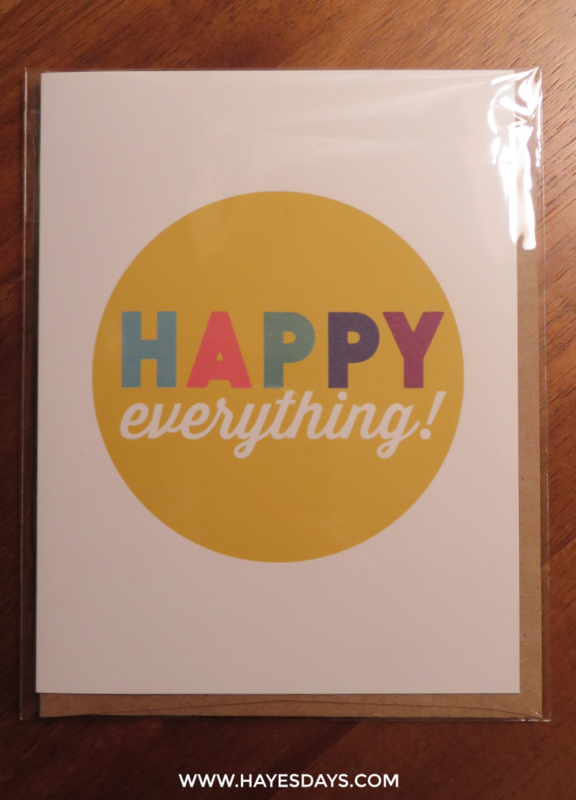 It’s just a card, no folding, perfect for a short and sweet thanks. Everything else was exclusive to the DBN Pen Pals box! These great cards are exclusive to the box this month and will be available in the shop soon! They’re folded, so you can pour your little heart out. 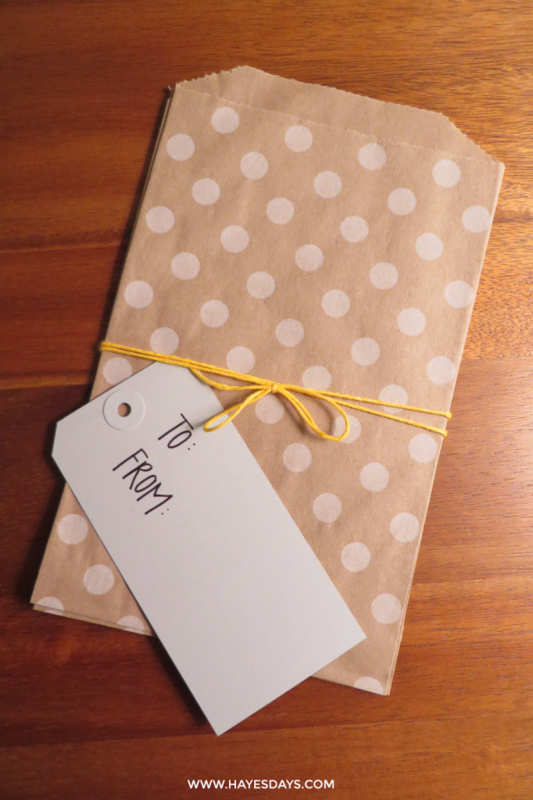 Included is an envelope so you’re ready to go! These bags and hand written note cards are adorable and were a bonus in this month’s box and not available in the shop either! Want a penpal box of your own? You will get approximately $25 worth of goodies from their shop in your subscription box each month. The more months you sign up for, the better deal you get. One month is $18, so you save $7 off the price of the items. Compare that to a three month subscription for $45– saving $10 off the retail price of the box items. So go ahead! Click here to sign up. Get ready to see more from DBN in next month’s box same time, same place, because I’m addicted. Last but certainly not least, congratulations are due to Alicia for winning the 3 month subscription to Birchbox! You’ve been contacted by email. Thank you so very much to everyone who entered! There will be another giveaway next month full of my favorite goodies, so make sure you’re following me via a social network so you don’t miss out! 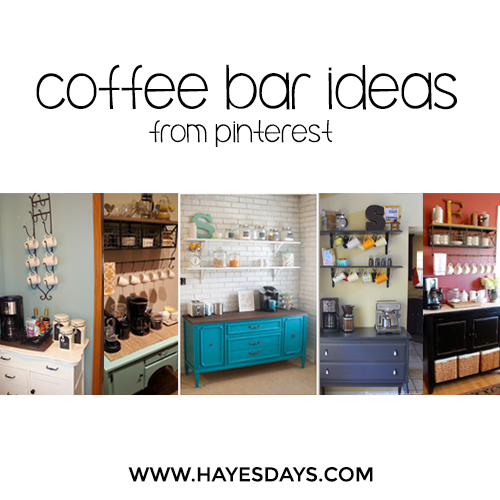 Now that I’m back and refreshed from a long weekend in the mountains, I was having a teeny mental block trying to decide which idea to pursue for today’s post, but settled on sharing some of my Pins that are the inspiration for our new coffee bar. The bar itself is a current work in progress that I’ll share when it is finished, but we did get this first component Sunday on our way home at one of my favorite places in Georgia. 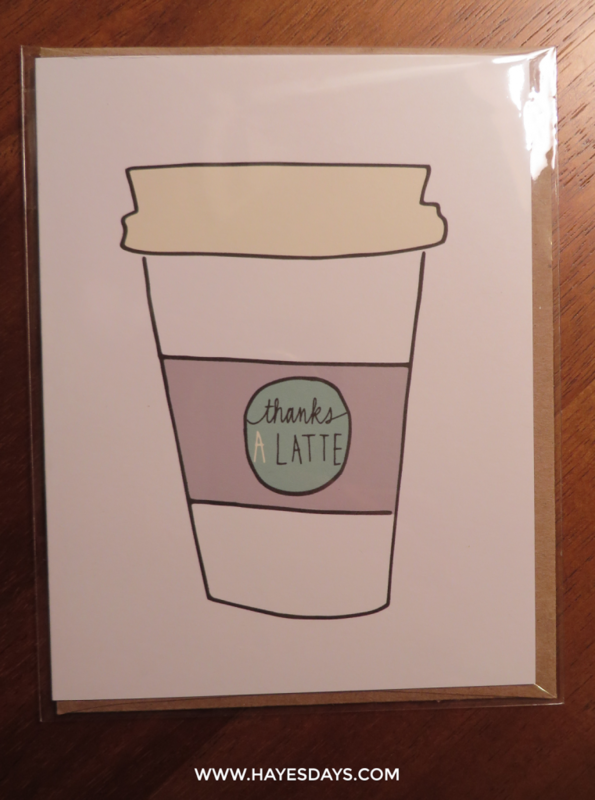 It is no secret to our family and friends that the hubs and I love coffee. Corey proposed to me in a Starbucks. That’s how addicted we are. So when people know there’s something you LOVE, almost every gift revolves around that. Our friends and family are constantly bringing us back mugs and cups as souvenirs and gifts. By no means is this bad, but we have accumulated so many mugs to the point where they no longer all fit on the glasses and mugs shelf. Let’s put it this way, we could both get a clean cup every day for our coffee for the next month without having to wash a single mug. 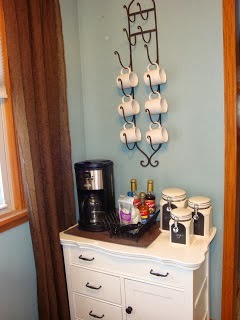 When images of coffee bars started floating around Pinterest, I immediately knew that would fit our needs. I really loved the shelves in this image. My grandfather-in-law didn’t want me to have shelves in my kitchen when we built the house, but now he thinks they look great and my mother-in-law has shelves now. 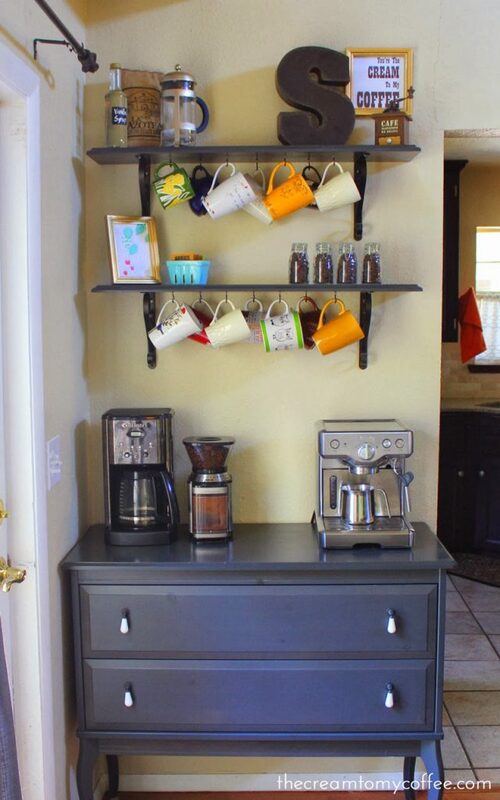 I would like to continue to have shelves on the little 38 inches of wall space for the coffee bar to tie it into the kitchen. This image I liked because of the rustic-ish. shabby chic look. My house doesn’t have an exact style, but rustic is definitely one of the predominating elements. The dresser. Simply put. I love it. 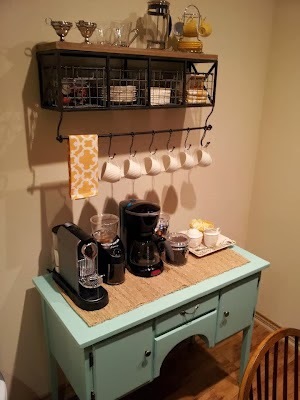 The bright color doesn’t lend itself well to my decor, but I knew I needed a dresser for our space so that we would have enough space to store our zillion and one mugs. 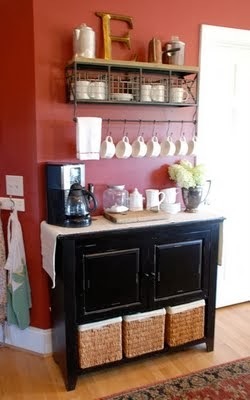 Most coffee bar DIY-ers took notes from the vintage wren and got that super cute rack from Hobby Lobby. This rack is great, but what I liked more about her take was the multi-use of the top. Mine will have to fulfill many roles too. From this image, I will be taking inspiration from the cute canisters. I love that she used chalkboard paint on them. Even though my canisters will be mason jars, they will get a coat of chalkboard paint and handwritten labels. I’m excited to have made progress on this project I’ve been wanting to make happen for several months now. 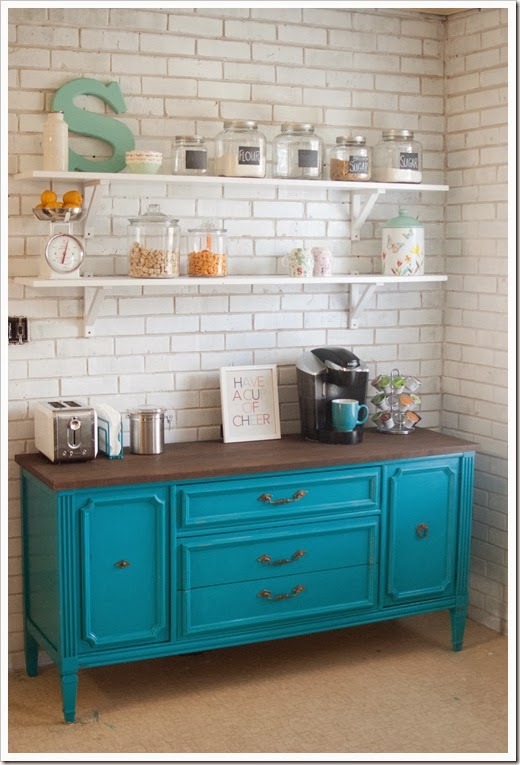 Do you have a coffee bar? Share your ideas with me. It’s Thursday! And that means two things: Friday is less than a day away and it’s time to link up with my favorite crafty gals Katy and Nicole. If you want to link up with us, leave a link to your post in the comments on one of our posts and link back to the three of us in the post on your blog. With an “H” on it of course. I love it! It has a pocket in the back, the pages are lined and have space for the date at the top. The elastic has held up for five months while being tossed around in my purse. My gold “H” is still solidly embossed on the cover. For the price, it is a steal. It’s quality is less than another leather bound notebook brand that will remain nameless that I love too, but the price is less than half! When I got my order, there was a little handwritten note warning me that their notebooks were addictive. Fair warning: they are. Have you ordered from poppin yet? Seen them around? 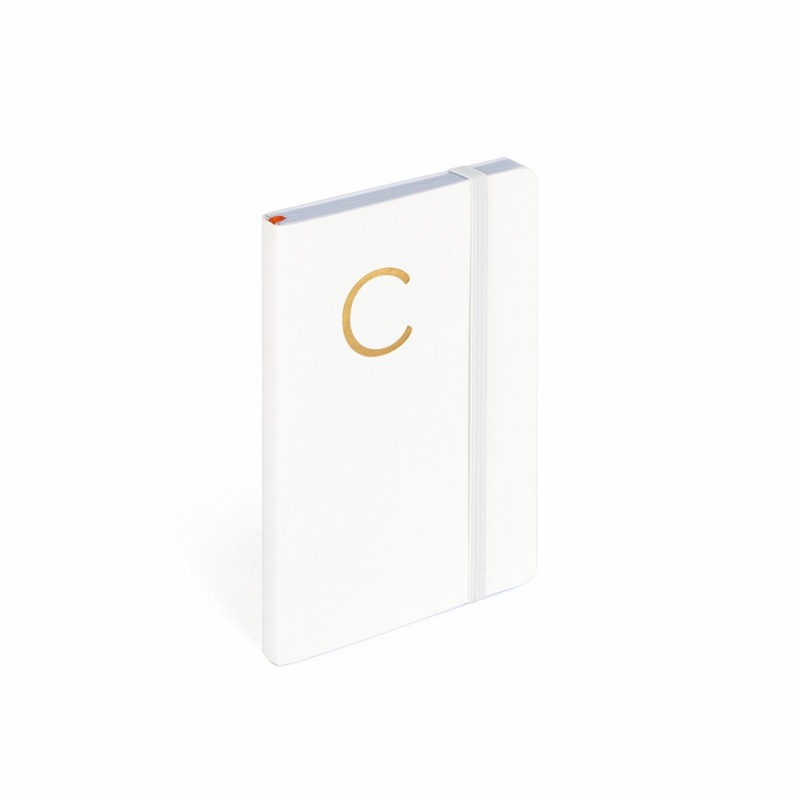 Give their little notebooks a shot! Don’t forget to let us know what your favorite is this week! While we were there last month, I tried to use My Disney Experience as much as possible to get a good feel for it. To recap: you get three Fastpass+ reservations per day at one park while you’re staying at the Walt Disney World Resort. Continuing from last month’s “before you go” post, these are three things that the My Disney Experience app can help you do so you can save time in the Parks. The app is not without its issues. When we were visiting in January, the app was very slow and sometimes did not even load in the park. Writing down and printing out your reservations is a good step to take that many Disney travel blogs (and this blog) are endorsing. This month, the app got an update, but I have yet to be able to test it in the parks. Definitely in May for me, but I’m sure others will be giving it a shot before then. If all else fails, you can ask a FastPass+ cast member to help you. There were many of them available if you needed help. Not quite sure how higher volume days will go as far as having ample help. Disney is still working out the kinks in this new program, but it seems to be shaping up better than I expected it to! Have you used it yet? Any tips? What do you think of the changes? As always, if you have more questions, just contact me! I’d love to help. 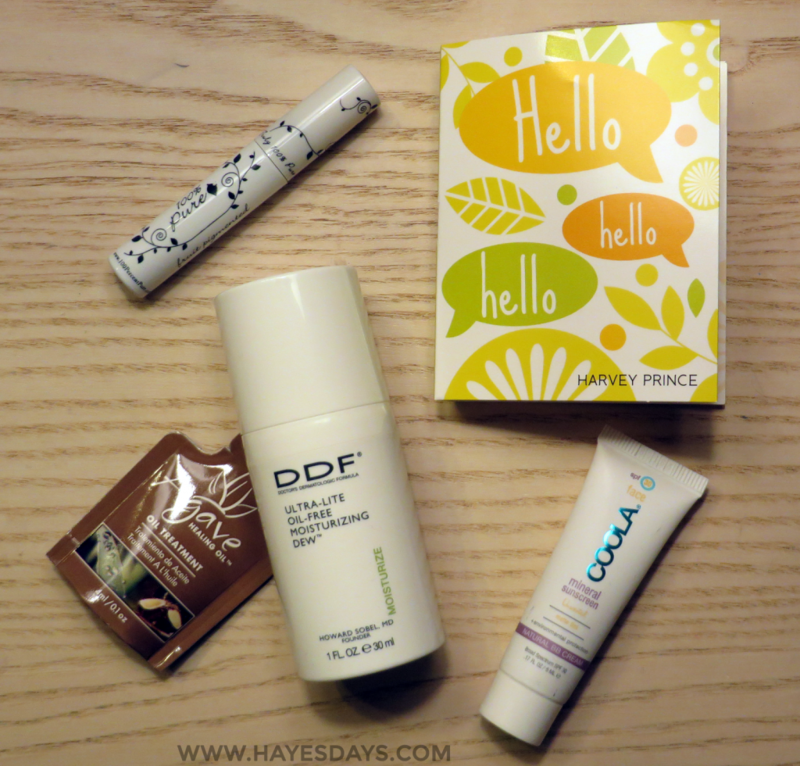 Style Day: February 2014 Birchbox review and a GIVEAWAY! Check out the details on this below! But first, here’s my initial thoughts on February’s box. This is the list of what I got in this month’s box. Birchbox teamed up with Us Weekly for the awards season. The box’s theme is supposed to be making you camera ready. 100% Pure: This month’s 100% Pure item is mascara that is naturally tinted. It smells just like the lotion from last month. Overly blueberry. This smell fades a lot slower than the lotion and you’re supposed to put it on your eyes? I’m not sure about this at all. Agave healing oil treatment: Hydrate and protect are two things I need. I’m indifferent about this one. I will try it though. COOLA tinted matte SPF 30 for face: I’m very unfamiliar with “matte” products. The smell is low though. The tint is a little dark for my extremely pale skin. I may try it in place of my moisturizer on a day I can stay home. DDF Ultra-Lite Oil-Free Moisturizing Dew: From what I understand, a dew is supposed to hydrate like a moisturizer, yet give you a glow. We’ll see if this does that. Harvey Prince Hello: This smells OK. Really strong. I don’t care to receive scents in my box since I am allergic to most stronger smells. Not sure if this will get tried. Over all, I’m pretty indifferent about February’s box. I’m not overly excited about anything or bummed about the box. 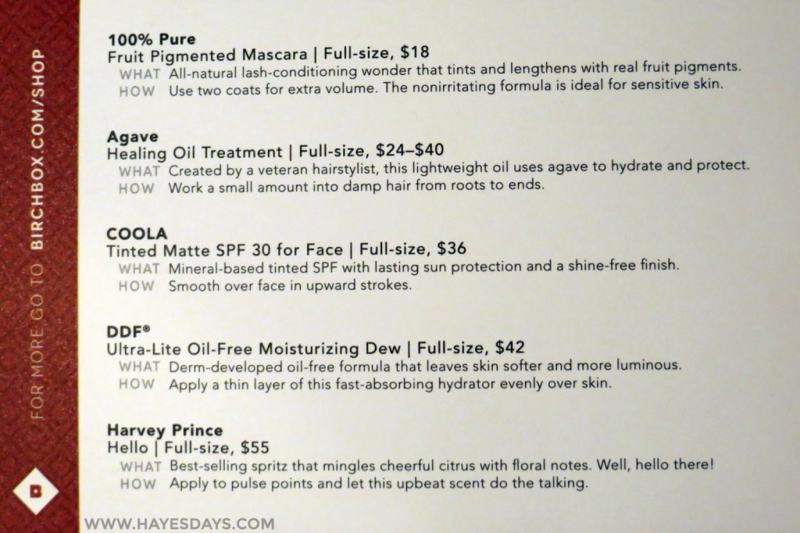 I’ll give these products a shot and update next month. The tea was taken to work and sipped by my co-worker. I was not interested in those at all. The 100% Pure lotion moisturized really well, but I couldn’t get over the smell. At all. This is a 100% no go in my world. I ended up really liking the Toni&Guy hair treatment. I am alternating it with my usual after wash treatment product. This I would recommend. The resist c15 super booster I never tried. Sorry. That product just wasn’t for me at all. Nail rock was the item I was most excited to try (which you would know if you followed me on IG). It was just super messy and you didn’t get a whole lot of velvet in the pot. Maybe for an accent nail or two, but an entire manicure was over the top, for my personal taste. 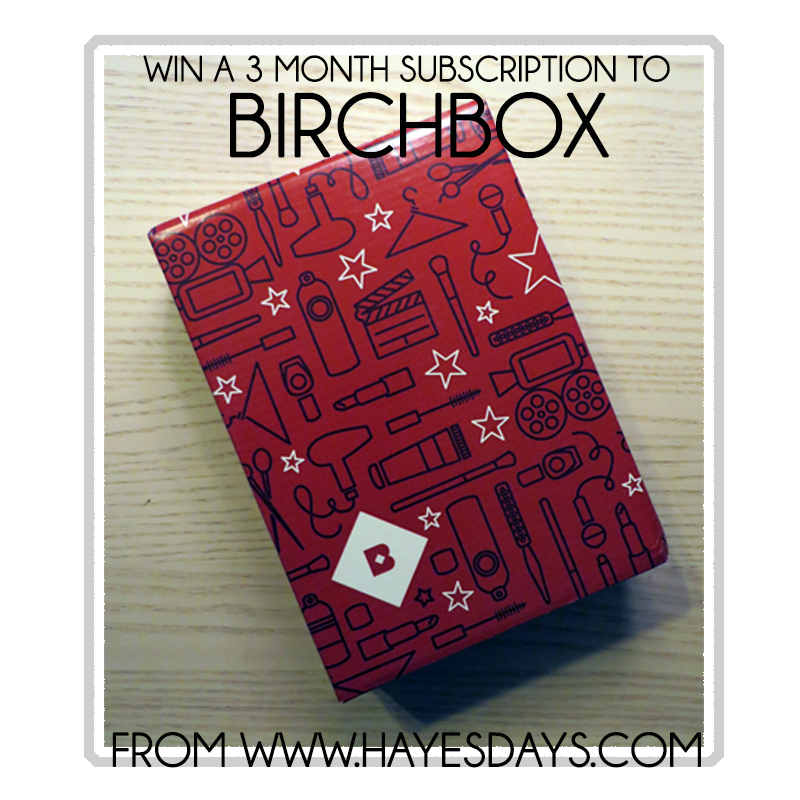 Now for the exciting part: I’m giving away a three month subscription to Birchbox! You could be trying next month’s items at the same time as me. Make sure you take advantage of all the ways to enter and check out my Instagram for a way to earn a bonus entry. The contest will end next Wednesday, February 26, in time for you to sign up to receive your March Birchbox.